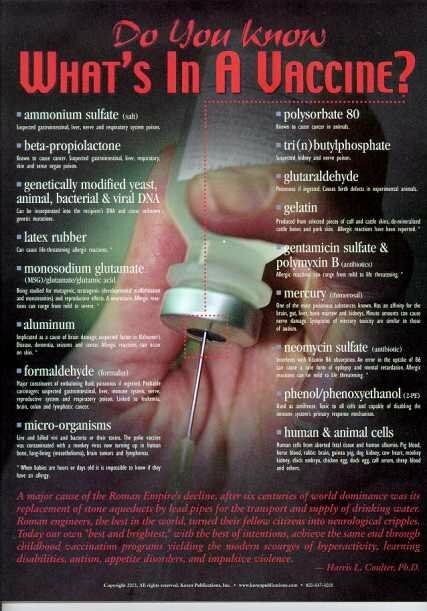 Ammonium sulfate (salt), beta-propiolactone, genetically modified yeast, animal, bacterial & viral DNA, latex rubber, monosodium glutamate (MSG), aluminum, formaldehyde (embalming fluid), micro-organisms (virus, bacteria, etc.) polysorbate 80, tri(n)butylphosphate, glutaraldehyde, gelatin, gentamicin sulfate & polymyxin B (antibiotics), mercury, neomycin sulfate, phenol/phenoxyethanol, human & animal cells. If you have any doubt these are harmful, then look at the next page. Reported Deaths and other injuries are just that, reports, not proven "cause and effect" events. However, adverse events are grossly under-reported. The FDA says actual event to report ratio may be 10 to 1, a study in NY says 40 to 1 ratio, a small vaccine maker says 50 to 1 ratio and one CDC study has said the actual ratio may be as small as 100 to 1. A common estimate is that vaccine adverse events may be in the 300,000 total per year range. 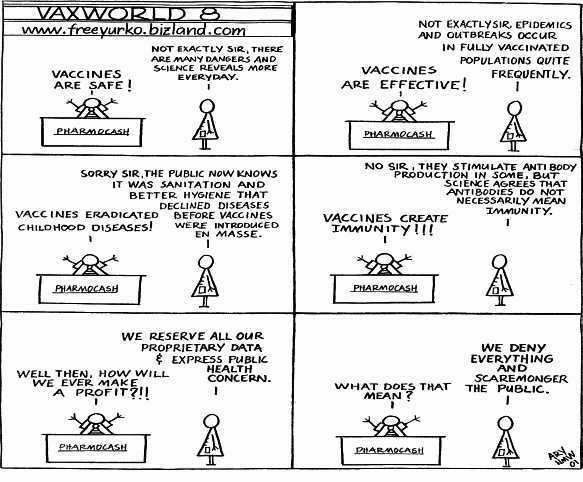 In the years, 1991 to 2000, reported deaths each year associated with vaccines ranged from 145 to 251. Reports of infant (age <1Year) deaths ranged from 86 to 182. What happens if 'immune deficient children' are vaccinated? Every Second Child by Archie Kalokerinos, M.D. This study into infant and children's death amoung Australian Aboriginal death in the 1970's detailed how child mortality doubled, and then continued rising to reach, in the worst case areas, 500 per thousand. 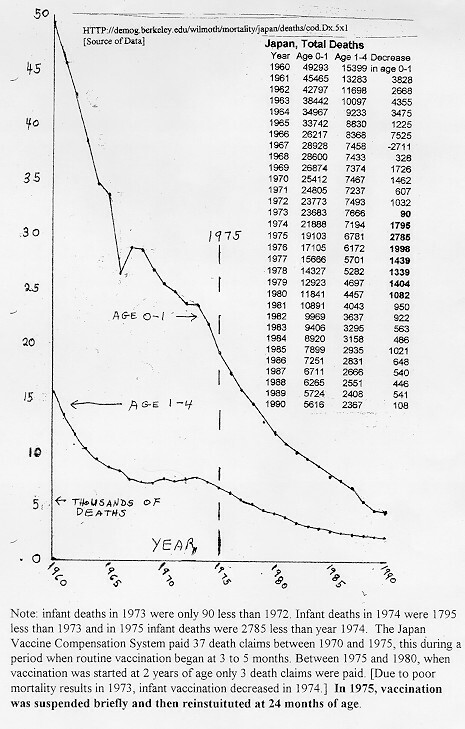 This increase in deaths occurred following stepped-up campaigns of vaccination. When Dr. Kalokerinos gave Vitamin C both before and after the vaccinations he reduced the high death rate from vaccination to near nothing. Yet the 'authorities' were reluctant to admit that the vaccinations were dangerous even with this obvious proof. If vaccines lead to the death and illness of 'immune deficient children', what happens to the mortality and health of children raised in better circumstances? For the answer to this question, see the next frame where Japan stopped vaccination in children under aged two years and saved lives. Infant lives were saved in Japan in 1975 when the government agreed to raise the minimum vaccination age from 3 months to 2 years. Virus OR filth and malnurishment? digital, static, dependent upon specific antibodies. analog, dynamic, dependent upon a clean and well nourished blood stream. Here: digital refers to ON or OFF, a state of immunity which either IS or IS NOT. Analog refers to an immune system which may be at any level between nothing (susceptable) and totally immune. Static refers to the concept that the immunity changes slowly over months or years. Dynamic refers to the concept that immunity may change rapidly even in minutes or hours but easily over a few days or weeks time span. There is evidence that specific antibodies are a poor, at best, measurement of immunity. There is strong evidence that overall health is the best measurement of immunity. Overall health is characterized by 'balanced cell chemistry' which is another way of saying the body is non-toxic. For a wealth of information on vaccinations, return to our Index page.